When my daughter turned one, we decided that we would get her a pet since she showed interest in the neighbourhood animals when she saw them. We decided to get her a cat, so I started the search for a female cat. It didn’t take long to find any, we just had to wait a few weeks until the kitten was old enough to leave her mother. Since our house was already child-proofed, we decided we better get it kitten proofed. The day came for us to pick up our kitten, and ended up with two little girls we named Stoney and Gypsy. Madisen was so excited when we let them out of the box. She chased them around and of course, the ran away from her, making it a game. 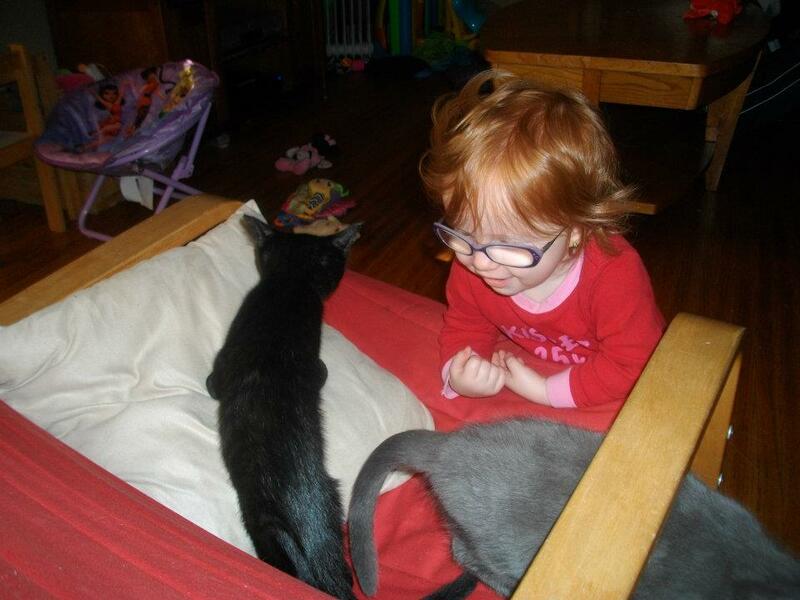 So from that day on, Madisen and the cats have been the best little buddies. Lets just say between the 3 of them, my house gets pretty messy. Kids toys, cat toys all over and I can’t just blame one, they seem to share the toys. If I am not picking the toys up I am tripping over them, almost falling and injuring myself. I pick them up, put them away and then within 5 minutes they are all back out. Meal time seems to be the messiest time of all. My cats are like dogs who beg for food, and Madisen is more than willing to share, dropping or throwing the food at them. I sweep the floor after every meal, but I somehow seem to miss areas and end up stepping in the food. With Cats and Kids, cleaning is a never winning battle, at least for now. Tagged pets. Bookmark the permalink. Even when the kids stop dropping and throwing food, somehow mealtime is still messy around here! Our friends have 3 boys and 2 cats. We house site and baby sit for them on occasion and I can understand how much of an adventure it can be! Our cat drops toys all around, but thankfully he’s neater with the food! we don’t have pets and I still can’t keep a clean house….. In order to save my sanity when I went back to work we hired someone to come in to clean once a month and I am so glad we did! Thanks for participating in SASS, hope to see you back next week. I have an 11 month old and not pets but still can never manage to keep a clean house =/ lol! i had a well trained cat, who knew better then to beg or try for people food. Then my second daughter came along, and now all bets are off. She tosses food on the floor intentionally to feed the cat. She tries to share with him and hand him scraps, and had generally taught him some horrible habits. The damage is done. Now I have a cat who will hop onto the dining room table to help himself if we leave food sitting out. Sigh.